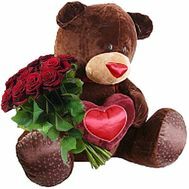 A bouquet of flowers with a toy is a touching, funny and romantic gift that you can think of. 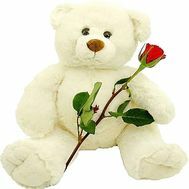 Soft toys are the best friends not only of children, but also of girls. One has only to imagine how your beloved falls asleep in an embrace with a new plush toy, thinking about you, as the hand itself will be drawn to the order form. 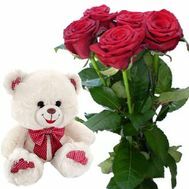 A bouquet of roses and a bear is what will make any holiday better, bring in it childish and sincere joy, love and impeccable tenderness. For every person, childhood is the best period in his life. 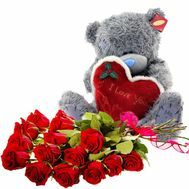 Carefree, joyful, full of a huge number of pleasant gifts. 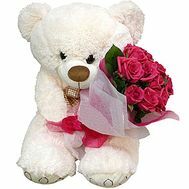 But in all people and to this day there lives a little child who will be insanely getting a teddy bear with flowers for the holiday. 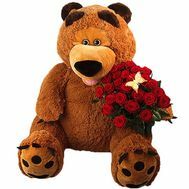 A bouquet of flowers and a bear is the combination that you can not pass by. 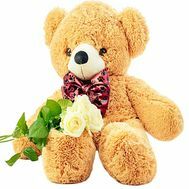 Flowers and a soft toy have always been the combination by which hearts were conquered and the strongest family or love bonds were born. 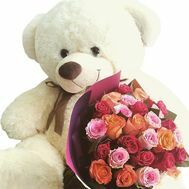 It's not difficult to guess that a big bear with a bouquet of flowers will be an excellent gift for the anniversary of relations with a beloved girl or even a way to admit to her in love. 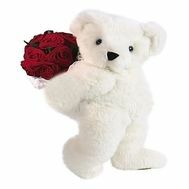 Florists recommend for such purposes to choose a bear of pastel shades with bright, red roses in a bouquet. 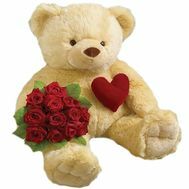 Just a soft teddy bear with flowers is a great gift for children, both for yours and for the tribes on Birthdays or family gatherings. 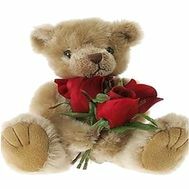 For more adult children, say, for teens, we recommend choosing a soft bear toy with a bouquet of roses - a caring but restrained gift in emotions. 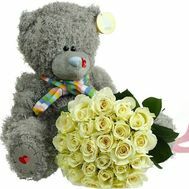 We are an online flower shop, which has more than 10 years of experience in the Ukrainian market. We have a lot of regular customers, the number of which has recently exceeded 20,000. 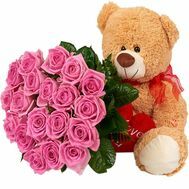 You can read about this and much more in the comments section, as well as see the photos of the delivered bouquet deliveries from our store. We have many payment methods, so you can choose that currency and the way in which the order will be settled. Due to this you do not need to run to the bank or to the nearest ATM. Are you looking for a gift that would impress a person close to you? 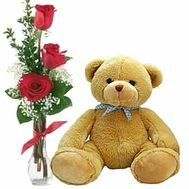 Choose a soft teddy bear with roses, and also take part in promotions from our store, making your purchases better, more reliable and cheaper!